Wasn't going to review infected beer, but saw others did. 22 oz bottle poured into a snifter at cellar temp. Batch 001 bottled on 4/24/2015. A little worried with some of the infected reviews for this one, but I'll give it a run through. The beer pours a deep garnet hue with a few lazy streams of carbonation rising to a creamy khaki colored head of 2 cm that rests on the surface. The foam fades slowly leaving a robust edge layer and almost totally covered surface layer. Looks really nice and the reddish color is really nice. the aroma is lots of bourbon, a bit of oak, some cherry notes and a bit of vanilla. Didnt expect the cherry and surprised a little by that note. I also get some alcohol that isnt surprising at 9.2%. The first sip reveals an average body with very fine, gentle rolling carbonation. The texture is a little sticky and does coat my palate on each sip from the snifter. Flavor is as advertised by the nose with a bit of sweet malt and brown sugar that moves to fairly strong bourbony and vanilla flavor, but again I get some cherry notes and a bit more tartness on the flavor. I dont get any hops anywhere on this beer. Its a decent big boozy brew, the cherry notes are unexpected but dont ruin the beer IMO. worth a shot, unless you absolutely dont like tart flavors. I am adding some to this, I finished my review before finishing the bottle. As I neared the end of the glass, I got more and more acidic which I cant expect was supposed to be there. Definitely some flaw in the beer, but it doesnt make it a drain pour IMO. Draft pour, could not finish the 6oz. Darker red color with a very small head which dissipated very quickly. Low carbination and a very large amount of alcohol in the nose. Over the top amount of alcohol in the taste with a molasses style malt. Way too intense. Not at all what I expected. It's more like a Flanders red ale than a bock, but since I like the Flanders style, I really enjoyed it. Totally bursting with sour cherry/dark fruit flavor. It might not be what they were intending, but I don't really care. It's one of the most interesting beers I've had in quite some time, and a total surprise. Poured from a bomber, head fades quickly leaving n amber pour. Sweet nose, flavors of caramel, dark fruits, with some red wine afternotes. So, I usually don't read other reviews before writing my own, but when I saw a lackluster rating, I had to look. I think some reviewers must have had an infected batch. Mine, however, was thankfully wonderful. From a bomber, this still beer is clear and mahogany in color. The smell is all malt....crackers, brown bread, and a little nut scents. The taste is semi-sweet, warming, and had incredible malt flavors. Full in body and very enjoyable. I found this one to be a wonderful brew. T: High levels of the bourbon barrel, if there was any other taste to the original beer, it has been lost to the burning barrel. F: Delicious, but ultimately lacking that bliss of unique feel, but does have a very delayed effect as far as alcohol goes. O: This is an enjoyable beer but needs to retain some of the original beers flavor as to add to the bourbon barrel field. I enjoyed the beer but I would not say I'm not in beer heaven when I drink it. I would recommend this to friends but know that there are better out as far as bourbon barrel. 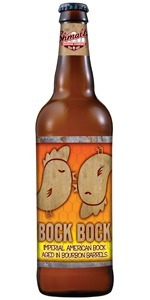 Would love to try the original bock next to the bb. On tap at The Old Toad in Rochester, NY. This one pours a light clear amber red color- it looks maybe a little bit thin. There's a very small head, and absolutely no lacing. Unsurprisingly, this smells absolutely nothing like a bock. Schmaltz doesn't usually seem to be concerned with style guidelines, from what I can gather. There's some definitely light sweet caramel, some nice oak character, toffee, maybe a little bit of maple. Smells like a light BA barleywine, honestly. Upon further inspection of the taste, this just feels like a subdued barleywine- which isn't a bad thing. It's a bit thin, but that doesn't detract too much, and makes it more drinkable than expected. There's no booze flavor, with lots of nice sweet caramel and toffee, and just a hint of maple. There's no hop character that I can discern, but I wouldn't really expect there to be any of that. There's just a small hint of bourbon, but a nice smattering of oak is on the finish. This is lighter bodied, and definitely pretty thin, with a lower level of carbonation, and a somewhat crisp finish. This is definitely a cool little beer, very interesting to try.